In the Provence-Alpes-Côte d'Azur region (PACA)—the administrative territory that spans from the Italian border to the Rhône river valley, and from the Mediterranean shores to the Alpine summits south of Grenoble—the dream of hosting ITER dates back to the mid-1990s. Back in 2001, the local governments around ITER pledged a total of EUR 467 million to the project, including EUR 152 million from the regional council. 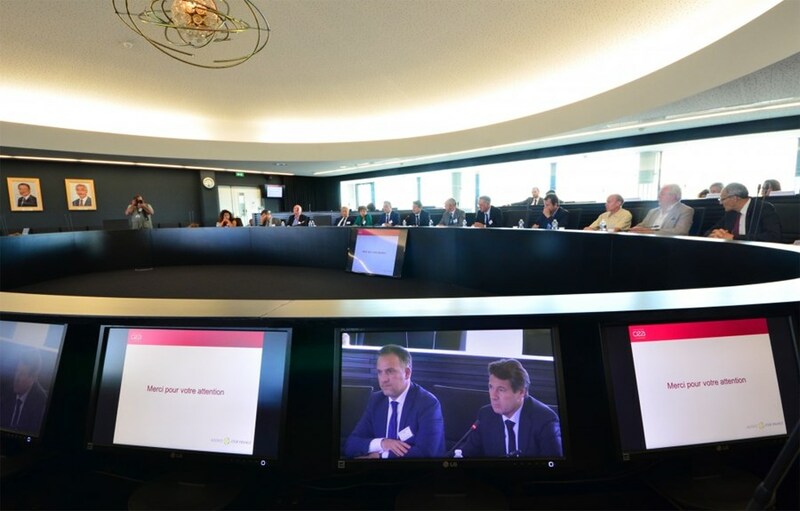 Last week, Christian Estrosi, (right, on the computer screen) chair of the Provence-Alpes-Côte d'Azur regional council, announced that he would add an additional EUR 43 million to the institution's original contribution. It was given concrete expression in 2001 when the PACA local governments volunteered to financially contribute to the project, on the condition of course that ITER would be built in Cadarache. The condition was met four years later and, true to their word, the PACA region, as well as the six départements that it includes plus the greater Aix-en-Provence metropolitan area, pledged EUR 467 million to the ITER Project over a period of 10 years. At the time, it was nearly equivalent to the contribution of a full-fledged Member. On Thursday 15 September, the president of the PACA region Christian Estrosi, former Deputy Minister in charge of industry, announced that he would add an additional EUR 43 million to the institution's original contribution of EUR 152 million (part of the EUR 467 million pledge). The announcement was made following a meeting of the Comité des financeurs—representatives of the French administration and local governments—held at ITER Headquarters. The additional contribution will be spent partly on the machine (EUR 13.5 million) and partly on improving road access to the ITER site (EUR 30 million). Beginning this year, EUR 1.2 million will be attributed to the re-opening of a road dam linking the east and west banks of the Durance river in the vicinity of Cadarache. Another EUR 4 million is earmarked for works and equipment to improve traffic fluidity at the exit of the A51 thruway. "It is of vital importance to improve the road system around ITER and Cadarache, through which approximately 10,000 people transit every day," said Estrosi. What is at stake in ITER, he said in an interview on local TV, "is the future of the planet." Something important enough to justify a renewed effort from the institution he chairs.